Lawrence of Berkley and I made a quick trip the Sunday before the Woodward Dream Cruise to the intersection of Woodward Ave. and Thirteen Mile Rd. in Royal Oak Michigan. Our hope was to get some of the beautiful old cars in the fading sun and before the storms rolled in. Shortly after we arrived though the owners and spectators both started to scurry away as the lightning grew near. This old Buick happened to be stopped at the light though giving us the chance to grab a couple frames before it turned onto the Avenue. 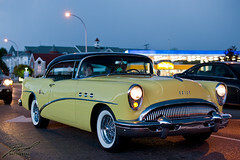 Thanks to ssx213 for spotting that this is a 1954 Buick.